The circle is the symbol of the Federal I Corps. Erected 1885 by State of Indiana. Location. 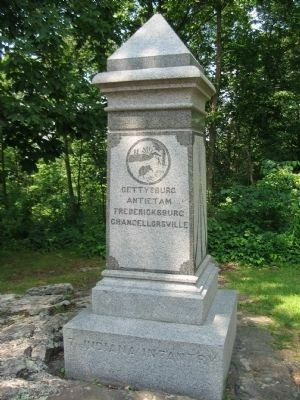 39° 49.217′ N, 77° 13.225′ W. Marker is near Gettysburg, Pennsylvania, in Adams County. 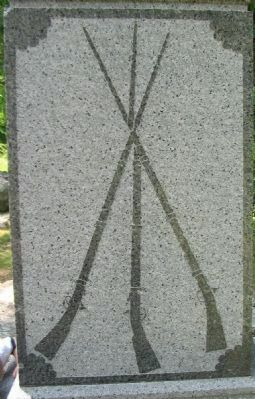 Marker is on Culp's Hill Loop, on the right when traveling west. Touch for map. 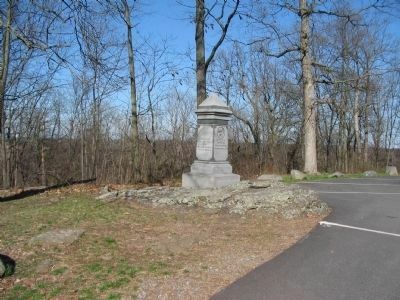 Located at the upper crest of Culp's Hill in Gettysburg National Military Park. Marker is in this post office area: Gettysburg PA 17325, United States of America. Touch for directions. 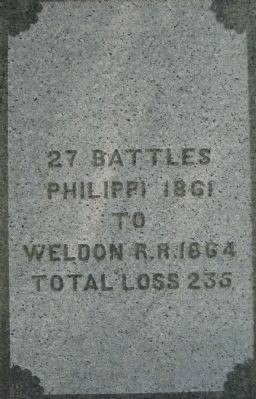 distance of this marker); Battery K, Fifth U.S. 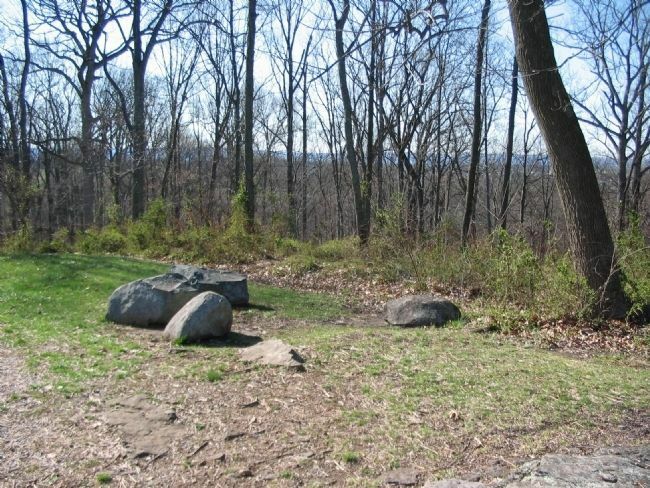 Artillery (within shouting distance of this marker); Independent Battery E (within shouting distance of this marker); Defense of Culp's Hill (within shouting distance of this marker); George Sears Greene (within shouting distance of this marker). Touch for a list and map of all markers in Gettysburg. The State Seal of Indiana is above the inscription. on July 1 at Emmitsburg when moving to the battle. — Submitted December 4, 2008, by Craig Swain of Leesburg, Virginia. Depicts a stand of muskets. Behind the monument are the traces of earthworks used by the regiment during the battle. More. 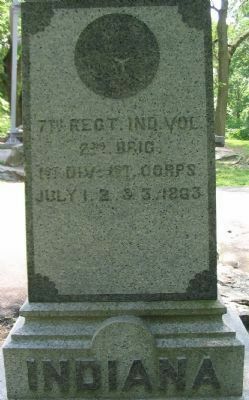 Search the internet for 7th Indiana Infantry. Credits. This page was last revised on June 16, 2016. This page originally submitted on December 4, 2008, by Craig Swain of Leesburg, Virginia. This page has been viewed 1,194 times since then and 9 times this year. Photos: 1, 2, 3, 4. submitted on December 4, 2008, by Craig Swain of Leesburg, Virginia. 5, 6. submitted on April 17, 2009, by Craig Swain of Leesburg, Virginia.